Eli Manning celebrates after the Giants clinch a 17-14 win over the Patriots in Super Bowl XLII. Click the title link to read the full NFL.com story. 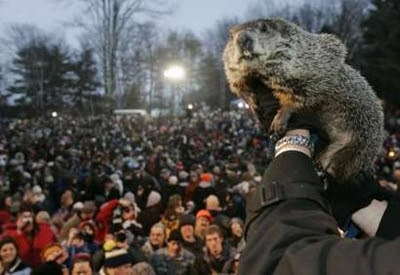 Punxsutawney Phil saw his shadow Saturday, leading the groundhog to forecast six more weeks of winter. Click the title link for the full "My Way News" article.